Mrs Silvia is a promoter farmer from our Centre of Excellence in Chirinos, Peru. Her farm demonstrates the whole coffee process and how best practices and innovations such as solar drying can be used in order to improve coffee yield, quality and incomes. As one of around 200 women at the cooperative (about 25% of the overall membership), and amongst the younger within the membership, she part of a strong and growing trend of young female Peruvian coffee farmers gaining recognition for their work. Silvia comes from a family of coffee producers in the San Ignacio region of Northern Peru. She has a farm of about 2 hectares and has been a member of the cooperative for about 7 years. Her experience in building a demonstration plot and becoming part of the Chirinos Centre of Excellence has been very beneficial for Silvia. Not least in helping her to learn about the best practices available to her to control and halt the spread of pests and diseases amongst her crops. 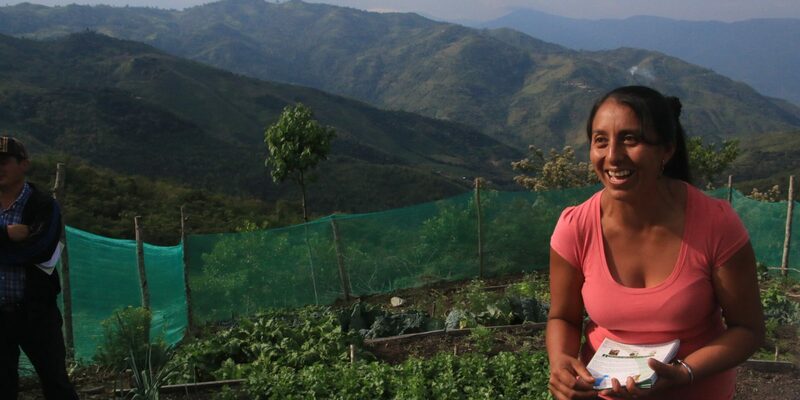 By becoming a promoter farmer she is now able to share the best practices that she uses with other farmers, demonstrating low-cost solutions to common coffee farming challenges.